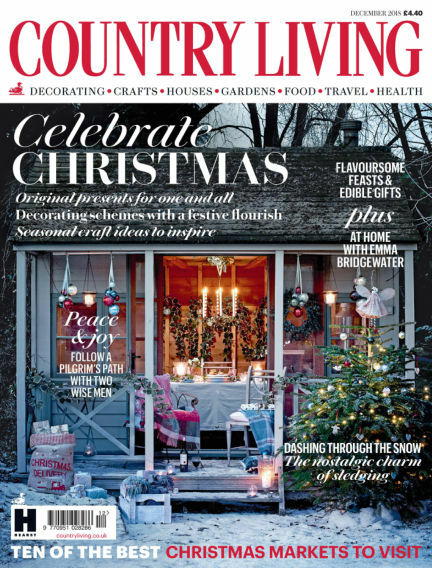 In this issue of Country Living - UK : “Country Living is for anyone whose heart is in the country. It offers a unique lifestyle package, mixing homes and decorating with food and farming; crafts and gardening with fashion, health and beauty". It immerses its readers in all aspects of the British countryside through the changing seasons; encouraging them to enjoy beautiful landscapes, experience nature and wildlife, stay in off-the-beaten-track hotels and support small rural businesses, craftspeople and producers. Country Living has long been a multi-platform brand with customers able to engage on many levels. The Country Living Fairs – in 9 different venues nationwide – bring together artisan producers from all over Britain. Some of these – and many more – sell their wares through our online General Store, shop.countryliving.co.uk, while a growing number of consumers follow us on Twitter, Facebook, Pinterest and our website countryliving.co.uk. They also buy our licensed products: books, stationery and a range of stylish furniture from our collaboration with British manufacturers dfs or watch our TV series, The Farmer Wants A Wife. This began as a campaign in the magazine to find wives for lonely farmers, and has since grown into a global TV franchise with the series currently airing in around 22 countries. Ultimately, what attracts the Country Living customer is the mood we create:readers of the magazine say it lowers their blood pressure, transports them to a world of rural tranquillity and that, most of all, it offers them an escape from the stress and strain of their everyday lives”. With Readly you can read Country Living - UK (issue Dec 2018) and thousands of other magazines on your tablet and smartphone. Get access to all with just one subscription. New releases and back issues – all included.